Re-reading the Fantastic Four comics from the start. As Secret Wars II comes to an end, here’s issue #288, our third and final (or is it?) visit from the Beyonder, and we’re just resetting continuity and bringing characters back from the dead all over the place. To recap: Dr. Doom is still alive, having switched his brain with an innocent bystander at the time of his “death,” with his reappearance and death again during the first Secret Wars remaining a question mark. Now back in action, Doom has taken on the mantle of the Invincible Man, attacked the Latverian Embassy, taken Sue hostage, and is luring the rest of the FF into a trap. The issue begins with Johnny arriving at the embassy and fighting Doom’s security robots. He finds the neighbor lady from the previous issue, who fills him in what’s going on, and then he catches up with She-Hulk and the Wasp, for more robot fighting. Reed joins the fight, and everybody confronts Doom. He’s ready for them, knocking them all out with some sort of gravity machine. Our heroes wake up, each in a cage doom has designed for them. Reed and the Wasp are in a porous sphere that lets air in but no physical objects out. Sue is in an energy field precisely tuned to her force fields. 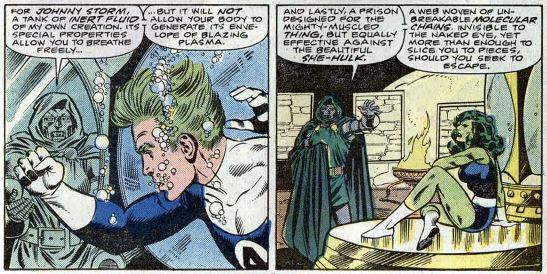 Johnny submerged in “inert fluid,” which lets him breath but suppresses his flame, and She-Hulk is surrounded by invisible molecular chains that will slice through her otherwise impenetrable skin if she tries to move. Doom takes off his mask to reveal (again) that his mind is in the body of Norm the innocent bystander. Doom explains that when he died in the fight with Terrax, his original body was destroyed, broken down into subatomic dust and cast upon the solar wind. To re-form his original body, he says he must go beyond traditional science and into the realm of black magic. Down in the basement of the embassy, Doom has contained the Flames of Falroth, a source of ancient magic. Even this can’t restore his body, though. All it can do is summon to this place the most powerful being in existence. The FF immediately know what this refers to. It works, and Beyonder shows up, pulled into the room against his will. The Beyonder is not happy about this, asking who dares to jerk him around like this. Note that the Beyonder has gone through tough times since we last saw him, so he’s no longer the kind, altruistic Beyonder from a few issues back. Doom starts in with the arrogance, calling the Beyonder his “slave.” The big B is ticked off, making a speech about all the darkness and despair he’s found inside human souls. He says he’ll end that despair by killing all humans, starting with Doom. 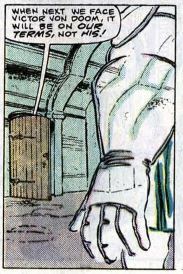 Reed stops the Beyonder, asking him why he doesn’t recognize Doom. Reed recaps the events of the first Secret War (in which Doom stole all of the Beyonder’s powers for a short while), but the Beyonder swears he has no memories of Doom. Doom, meanwhile, swears he has no memory at all of the Secret War. 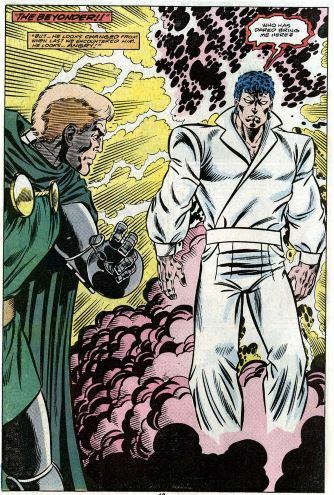 Reed asks the Beyonder to “look beyond this mortal form,” and only then does the Beyonder remember Doom stealing his power. 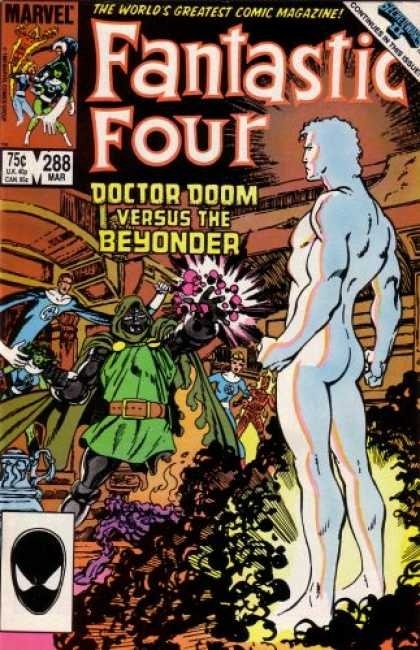 The Beyonder is ready to kill Doom, saying he intended to banish Doom somewhere far out in time and space. Reed interrupts, deducing that when the Beyonder gathered all the heroes and villains for the Secret War, the Beyonder summoned Doom from a point in the future — this point in the future, in fact. Reed pleads with the Beyonder not to kill Doom, because if he does, it will sever the time loop the Beyonder initially created. Doing so would destroy all of time itself, an event that not even the all-powerful Beyonder could survive. The Beyonder then goes into “fix continuity” mode, restoring Doom’s original body, giving Norm the bystander his own brain back, and then sending Doom back in time to fight in the Secret War. The Beyonder vanishes, and Reed frees the FF from their cages (the Beyonder freed him during their talk). Reed says they’ve got to escape the embassy, because the time loop is about to complete, with Dr. Doom returning from banishment in time and space to fill the absent space he left behind at the start of all this. (Or something. It’s real confusing.) To protect the innocent bystanders, the FF leave seconds before Dr. Doom rematerializes. Reed promises that the next time the Fantastic Four faces Doom, it’ll be on their terms. Unstable molecule: Reed is so badass that he schools the all-knowing Beyonder on advanced physics. Fade out: Sue’s hair is still all messed up and spikey from her interrupted haircut last issue. We’ll see how that turns out next time. Flame on: I’m real curious about this “inert liquid” that suppresses Johnny’s fire, now that it’s been established that he’s powerful enough that getting him wet no longer renders him powerless. Fantastic fifth wheel: A big deal is made about how this is the first time Dr. Doom meets She-Hulk (Secret Wars happens after this in his personal timeline, remember), and he describes her as “beautiful.” I wonder if writer-artist was setting up some future story here. 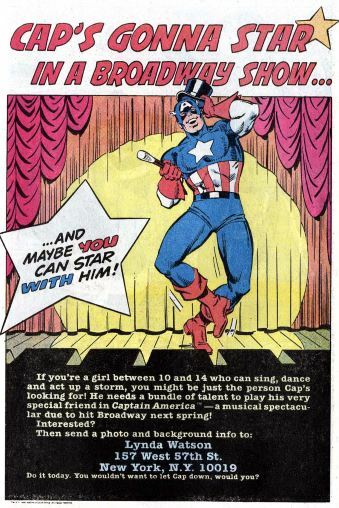 Commercial break: The Captain America Broadway musical! It never got made. I wonder if this ad had something to do with it never getting made. Trivia time: Whatever became of the Beyonder? In Secret Wars II #9, he tragically died while attempting to transform himself fully into a human. It was a sad yet somehow appropriate end for such a goofy character. It wasn’t truly the end, though, because every so often some writer at Marvel tries to bring him back, re-writing his origin each time. (Freakin’ Marvel.) We’ll eventually reunite with him in issues #318-319. There’s no mention of young Kristoff, or all the trouble he caused while pretending to be Dr. Doom. Kristoff will return, though. Oh, boy, will he. Fantastic or frightful? For someone who allegedly didn’t want to play ball with Secret Wars II, John Byrne writes the Beyonder better than most, making the character feel truly powerful and godlike, as opposed to jokey and childish. Other than that, though, the return of the one true Dr. Doom should be a lot bigger and more epic than it is. Instead, the whole thing taking place in a basement, with a lot of info dumping and not a lot of dramatic stakes.